And I began reading. About 20 pages in, gave up. And several times over the next dozen years tried again and again. But never made it past the first hundred pages, until 2003. In 2003, pregnant with The Little Sister I tried again. And this time the words came to life. I was pulled from page to page, and thanks to a queasy first trimester, had a perfect excuse to read for hours, and hours, and give Tolstoy's masterpiece all of the time it deserved. One: I finished. And completely understood why my professor said I must read it, and yes, he was right. Two: The Big Sister decided that she wanted to read it too. Her sweet 3-year-old self carried that copy around in her backpack for months, pretending to read it. Three: When Little Sister was old enough to appreciate a good book she also got attached. However, she thought Anna (see photo) looked like Mary Poppins and also carried around the well worn edition, even loaning it to her Nana (The Bean) to read, "the goooooood book." While the girls are not ready to read Anna quite yet, techincally, they already love it. Online, Project Gutenberg, click here. The Masterpiece Theater 1977 Version is available, try your local library. 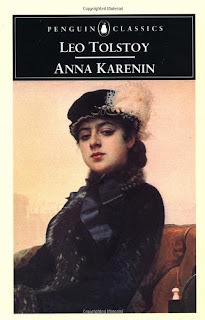 Oh Anna Karenina. One of my most favorites. Thank you for bringing this masterpiece to the forefront of my mind. I hope to read it again soon, after I finish My Antonia for the fifth time. . . I wonder if it is available an an audiobook? Maybe on librivox.org?